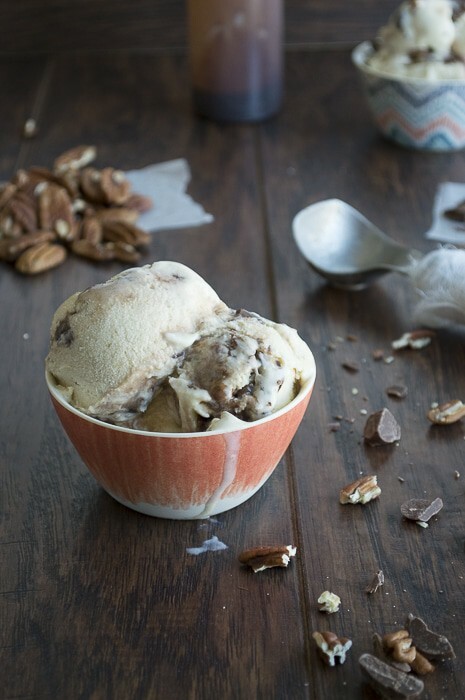 Find the largest bowl you have and come over for some banana pecan chocolate chunk hot fudge ice cream. 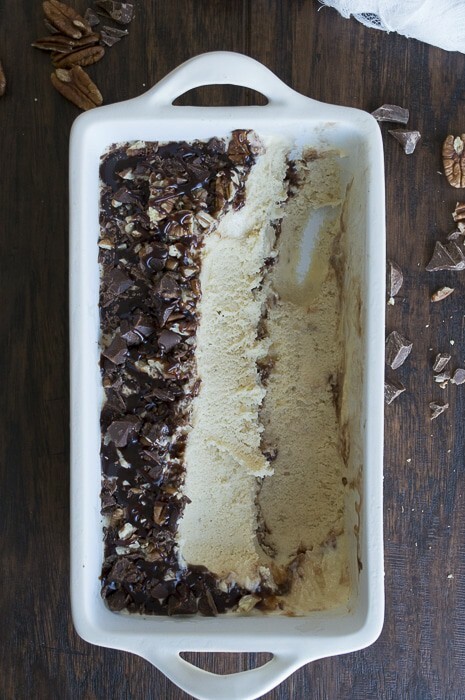 And the best part.. this fancy schmancy ice cream doesn’t require an ice cream maker. It only requires a little bit of patience during the freezing process. But it is worth it. 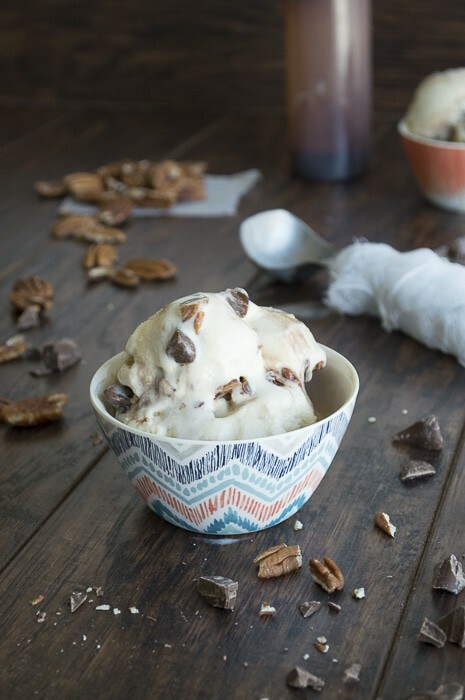 Pecans, chocolate chunks, hot fudge, repeat. You might not be able to see it, but there is TWO layers of chopped pecans, chocolate chunks, and hot fudge. Every scoop of this ice cream is loaded with awesomeness. Puree 2 of the bananas with half of the vanilla ice cream in a food processor until smooth. 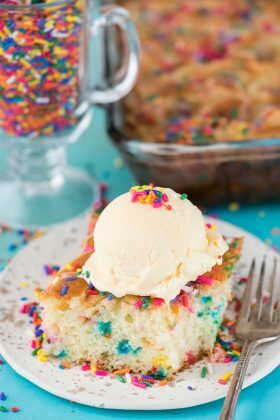 Pour this mixture into the dish you want to freeze the ice cream in. I used a loaf pan. Let this layer harden for 30 minutes before moving on. Be sure to cover with tinfoil. 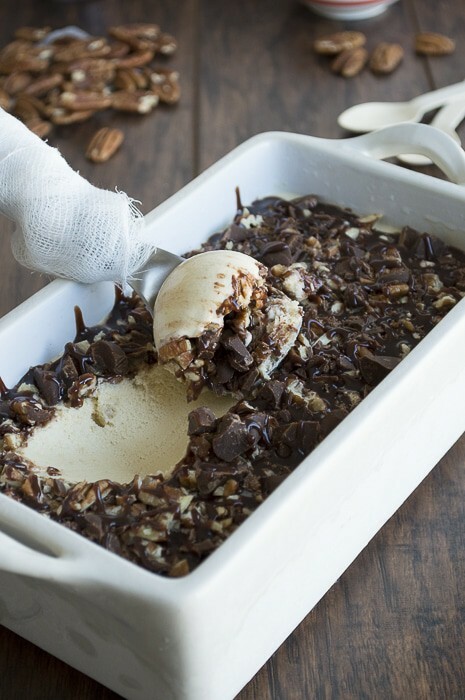 You want this layer to lightly freezer before adding the pecans, chocolate chunks, and fudge, otherwise those ingredients will drop to the bottom of the dish and not stay on top of the ice cream. 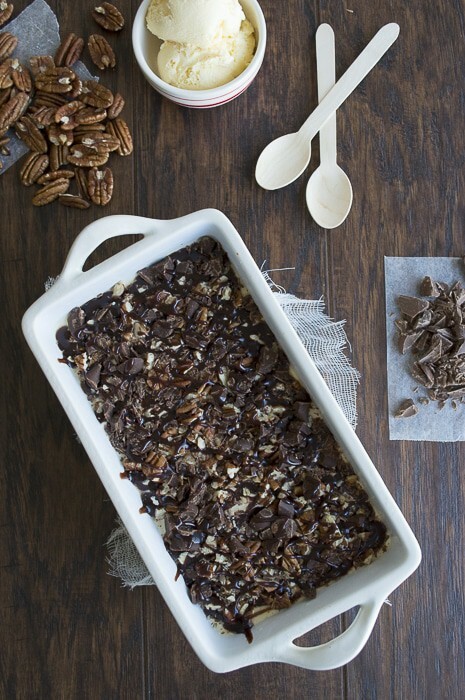 Once harden, drizzle on the hot fudge, and add the 1/3 cup chopped pecans and 1/3 cup chocolate chunks. Cover with foil tin and freeze for 10 more minutes. Meanwhile, puree the other 2 bananas and the other half of the vanilla ice cream until smooth. After the 10 minutes, add the other half of the ice cream/banana mixture to the pan. 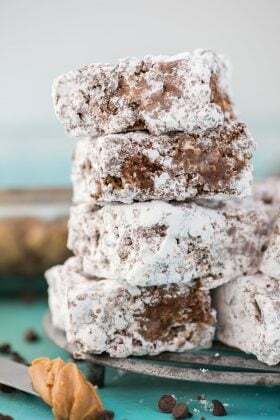 Let that freeze for 30-40 minutes before drizzling more hot fudge on top, along with the other 1/3 cup chopped pecans and 1/3 cup chocolate chunks. Freeze over night, covered with tin foil. If only I got around to making chocolate dipped ice cream cones.. mmmm. I would love to have the big dish of this ice cream. I am sending one over! I love this idea! 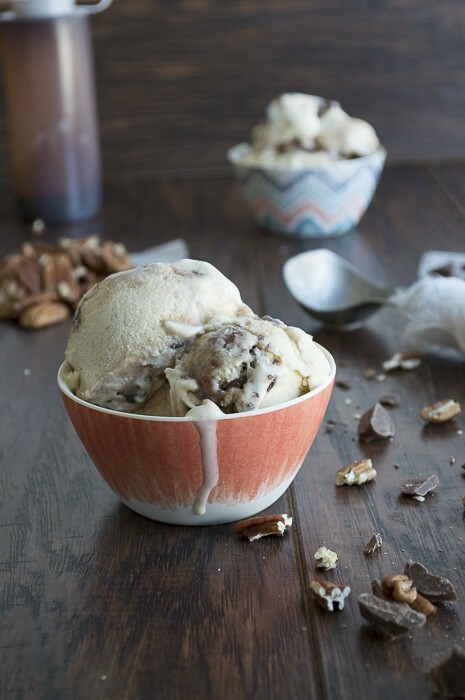 I always feel like there is not enough nuts and chocolate in icecream. That way I can decide for myself. Terrific! Looks delicious! That would be gone in no time in our house. Thank you friend! It only took us a few days to finish it! No ice cream maker?! I definitely need to give this recipe a try. Love that ice cream container too! Ashley, it’s a loaf pan – nothing fancy! Yum! Talk about taking normal vanilla ice cream to the next level! Anything fudgey is a friend of mine! I wish I could walk over to your house with some! 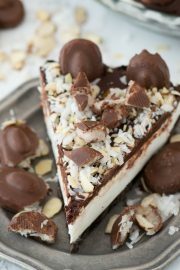 What a wonderful recipe,seen it on Bloom Designs Online. What a fun ice cream flavor! I want a bit bowl of it! YEAH! No ice cream maker! 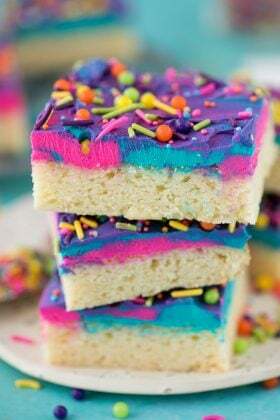 Wow, yummy! of course, everything you make looks amazing. Wow, what a flavour for ice cream! That is off the hook! All my favorites wrapped into one ice cream! 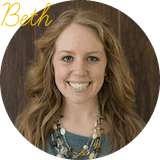 This sounds amazing, Beth! Thanks for linking it up to my Creative Ways Link Party. I just can’t help myself…You will be one of the features tomorrow night! 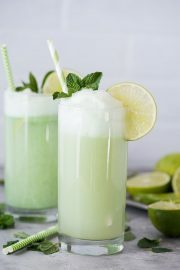 This looks wonderful Beth and refreshing! Thanks for sharing at MM with us! Pinned! Thanks for linking up at Family Fun Friday! 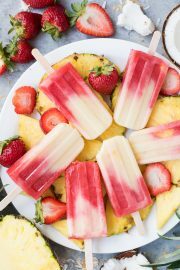 You’re featured this week on the list of Cool Summer Treats! Can’t wait to see what you’ll link up this week. Have a blessed weekend! Incredible flavor combo! Thanks for linking up with What’s Cookin’ Wednesday! This is like a homemade Chunky Monkey! Love it! Thanks for sharing! I didn’t even think of that, love it!! Yum! 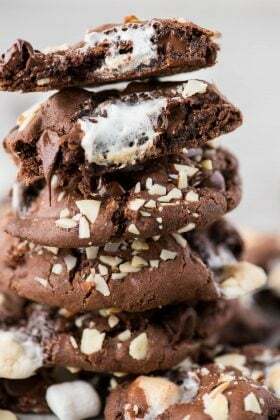 I will be featuring your yummy recipe at Tickle My Tastebuds Link Party! I can’t wait to see what you share this week. Oh my goodness! Your ice cream looks so yummy!